The longest main beam of any whitetail in the record book is under 33 inches. The shorter beam on the buck Brian Stephens shot is over 34! 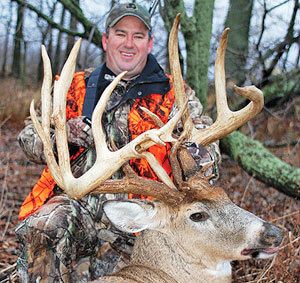 The score of the basic 9-point frame is a shocking 218 1/8 inches. I know, because this is precisely the situation in which I found myself Nov. 30, 2009 as the buck of a lifetime plodded toward my tree stand in Highland County, Ohio. The weeks prior to the 2009 gun opener, I was busy packing, buying last-minute odds and ends, and dreaming of monster bucks and good weather. The previous few years the weather had not cooperated with us for the first few days of the Ohio season, but this time around the conditions were great. Every year I anxiously await the arrival of the season. Deer season is a revival of stories (mostly lies) and friendships, and a time to catch up on another year gone by. We also have Mike "Buck" Deaton. He is usually responsible for giving out the nicknames. That said, I still haven't figured out how he became Buck. I usually tease him and call him "Doe" Deaton. He is currently trying to fend off a long buck drought, during which he has gone from being "big buck" selective to shooting anything with four legs. We are all pulling for a slump-buster for Buck this year. Buck is a longtime family friend, and is also one of the nicest guys you will ever meet. Every year Buck's wife Kathy sends a big pot of beef stew or cabbage rolls for our Sunday pre-hunt dinner. Buck lies every year and tells us he slaved over a hot stove all day preparing the meal. We all know Buck couldn't boil a pot of water. Buck is our dishwasher. Every year he threatens to bring paper plates and plastic cups, so he doesn't have to wash dishes. The newest member of the crew is my brother-in-law Kyle Robinson. Originally Kyle had been known as "Rookie," but he finally killed a deer, so that nickname no longer fits. After a several-year layoff due to his work schedule and military service, he returned this year and was christened "Possum." (Apparently, several years ago he shot a possum, and the name stuck.) Possum is our "stat" guy; we can always count on him for some useless piece of information. That Monday morning, the action started early for me. Just after first light, I heard rustling over to my left (east of my stand). A few branches cracked . . . then a small doe popped out. Before I even had a chance to get a good view of her, I spotted a huge buck in tow. They ran straight at my tree stand and then stopped about 50 yards out and slightly downwind. The rest of my morning was filled with thoughts of the giant. The more I reflected on what I'd seen, the bigger he got. I knew no one back at the house would believe my story. Yeah, right -- a monster buck and seven other bucks within 50 yards, but no shots. Just another lunchtime lie! I have truly been blessed with a great wife, two outstanding kids (Shelby and Cole) and the most supportive parents anybody could have. I am surrounded by an incredible number of good people. And that includes so many I have met since taking this buck. Their willingness to help and give advice has been truly amazing. At this writing, I have known Rick Busse (master taxidermist in Piqua, Ohio) for only a few weeks, but I feel I have known him my whole life. Jeff Davis has offered great advice and friendship, as well as some outstanding video footage. Mike Wendel, who measures for the Boone and Crockett Club, the Buckeye Big Buck Club and the Longhunter Society (muzzleloader record book), has been as nice as anyone could be. And I have spoken with many more people from newspapers and magazines, as well as fellow hunters and just curious folks, who have added to what was already a great experience. score or ranking in any record book. What makes him so historic is his incredible frame, which is arguably the biggest of any known whitetail. Totaling measurements of this giant's main beams (35 1/8 and 34 1/8 inches) and inside spread (24 3/8) gives us 93 5/8 inches. In whitetail history, the only other deer to even approach that total is the Brian Damery buck, taken by shotgun in Macon County, Illinois, in 1993. Adding up that deer's beams of 32 2/8 and 32 0/8 inches and spread of 28 3/8 yields 92 7/8. Those figure to exceed those of any other whitetail -- ever! As if all of this weren't enough to make the Stephens buck an all-time great, consider his left G-2 tine. At a stunning 17 7/8 inches, it ranks among the lengthiest on record. Put it all together, and you have a gross typical score of 218 1/8, which is downright scary for what amounts to a basic 9-pointer. Were there no abnormal points, this deer would have a net typical score well in excess of 200 -- as a 4x4. He'd be history's top 8-pointer by nearly 20 inches! 209 5/8 inches.